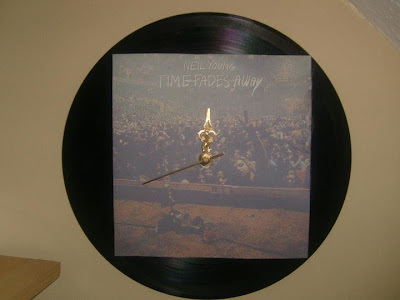 Neil Young News: You Know How Time Fades Away? You Know How Time Fades Away? As New Years Eve will be pretty busy, I've made the executive decision to celebrate the New Year Right Now. So for you all here is a "Time Fades Away Clock" for you to ring in the New Year. Have a Happy Shakey New Year! Because, you know how time fades away? Please tell me someone did not blasphemy a vinyl record this way! I own 12 copies of TFA. Gonna try to corner the market.... hold 'em ransom for Neil. (I remember Neil once said he wished he could buy every copy and destroy them, or something like that, like he did with the first pressing of Comes a Time). TFA will never see digital since all the tapes are gone. As a new year dawns, some things stay the same. The Bridge - we'll build it now - it may take a lot of time.